Counter Culture is located on the corner of East Cesar Chavez and Clara Street. Austin has always been known for its delicious and diverse food. 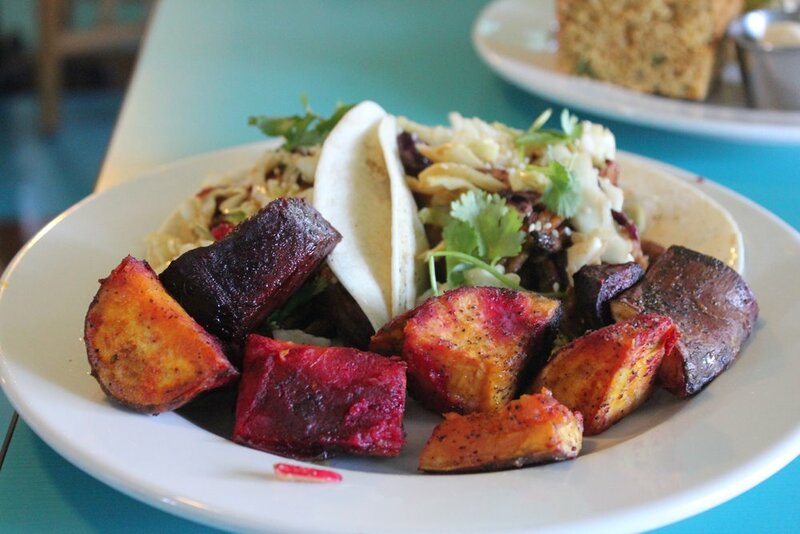 Although there is no shortage of tasty food, finding restaurants that are also vegan is a little more tricky, even in a city as progressive and food-centered as Austin. Luckily, there is a small vegan restaurant called Counter Culture down East Cesar Chavez on Clara Street. What makes this eatery different from most vegan-friendly places is that it is 100% plant-based. There are absolutely zero animal products used to cook the food. Another unique aspect of this restaurant is its focus on comfort food. While restaurants may have vegan or vegetarian options, they may still use dairy products to make some of their foods. As a result, they only have a few vegan choices. For this reason, Counter Culture stands out. Their comfort food consists of foods like pizza, burgers, mac n' cheese, tacos, ice cream and cheesecake to name a few. The cool, blue interior makes this spot a great place to hang out and grab some healthy food. The owner, Sue Davis, started Counter Culture as a food trailer in the summer of 2009. The reason she turned the trailer into a restaurant, two years later, is mainly because of animal activism. She wanted to show that animals are entitled to humane treatment and the possession of their own lives. “It was a way for me to promote veganism,” Davis says. Davis also decided to move into a brick-and-mortar location since she believes that if people knew that tasty food solely made with plants existed, then they would be more open to trying to adopt this lifestyle. However, if they are unaware of how simple and tasty this eating lifestyle can be, then they’re less likely to be open-minded about it. It is all about exposure and informing people. “I thought the best way to hit people is with their stomachs,” Davis says. Veganism has played a major role in Davis' life. She has been a vegan for 15 years now. However, Davis says this was not a quick change but rather a slow transition over the years. One of the first things that urged her to adopt the lifestyle was learning about how animals were being widely abused in the food industry. After that, she made a connection from what was being put on her plate to how it got there, and she went from there. As for the comfort food aspect, Davis began thinking about what she was missing and wanted to eat in her new eating lifestyle. Some of the recipes found on the menu today started out at the food trailer because Davis got a lot of feedback from her customers during that time. Counter Culture also makes sure to address other dietary needs that people may have. For example, the eatery offers not only meatless and dairy free foods, but it also offers raw, which involves uncooked vegetables. Gluten free, soy-free and oil-free are additional options on the menu. “As long as it’s cruelty free, I’ll try to make something for everyone,” Davis says. Most of the workers and cooks are vegans as well, but being vegan is not a requirement in order to work there. Davis mentioned that she has had workers who weren’t initially vegans or vegetarians, but after working at Counter Culture they transformed their eating lifestyle. “I just require a passion for cooking and food and being opened to it,” Davis says. The Beet Walnut Mushroom Burger is among the many delicious options offered at this vegan restaurant. One worker, Haley Womack, is an employee who is passionate about Counter Culture and what it stands for. She says she loves that it stands for the animals as well as the benefits it offers for the planet and for the human body. “My favorite part is the sense of community you get when you’re there just because these are people who are also passionate about veganism, composting and recycling, and taking care of the earth,” Womack says. Womack, now a vegan, started going to Counter Culture as a customer when she wasn’t vegan at the time since she liked the food. She also enjoyed the atmosphere of the place and decided to apply. After working there for about eight months now, Womack gave her take on what she thinks about the cooks and workers being mostly vegans. “I feel like it holds me accountable a little bit, just knowing that everyone else there has the same diet as me and we have things that we can talk about,” Womack says. Womack credits Counter Culture for inspiring her own grocery list and cooking in order to try new things. She says she will try to incorporate some ingredients used at the restaurant into her own meals. She is an even more frequent customer now. Counter Culture celebrates Taco Tuesday with one of customers' favorite items on the menu. As another frequent customer and vegan, Garcia recommended the mac n’ cheese because it reminds her of being a kid. The dish is topped with gluten free breadcrumbs and broccoli along with two sides chosen by the customer. The curry quinoa salad and cornbread are both recommended as sides. “I feel safe coming here, knowing that there’s no cross contamination, just everything in the kitchen is 100% vegan,” Garcia says. “Also, just the style comfort food, you don’t see much of that. Garcia also noticed the wide variety of foods listed on the menu. “I may not know what I want when I walk through the door, but when I look at the menu there’s so many different options whether it’s something sweet, something savory, heavier, lighter, they cater to it,” Garcia says. Counter Culture has become a new favorite place for vegans to indulge at. Most vegans cook every single meal everyday, but if one day they don’t feel like cooking or don’t have the time then Counter Culture is always an option. Whatever kind of comfort food they are craving, the restaurant has it at relatively low prices. Vegans not only appreciate the restaurant for its food, but for all that it stands for as well.